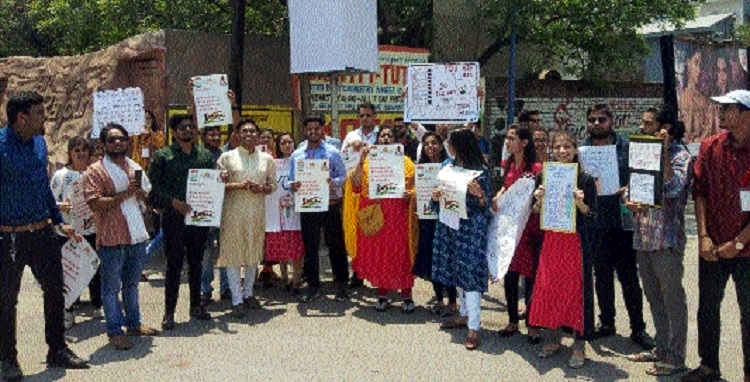 Apr 14 An awareness campaign was launched by Art of Living members to sensitise people about their voting rights in the capital. The youth wing of Art of Living carried out ‘Vote for better India’. Informing about the campaign, Satish Gokul Panda from Art of Living, said that youths are contributing in every field today with enthusiasm. This campaign has been launched to encourage youths to show similar enthusiasm in exercising their franchise. During the campaign the youths were informed as to why polling is necessary. Along with youths, it is necessary that people from every category of the society should know the significance of voting. Under the campaign awareness drive was carried out at Ghadi Chowk, Shankarnagar Chowk, Shahid Bhagat Singh chowk, Bharat Mata Chowk, Telibandha chowk, Make-in-India chowk, Turning Point, etc.